When the fire alarm system is normal and your HVAC unit is running, is the LED on the relay board ON or OFF? If the LED is on when normal the circuit is wired "fail safe" so that the unit will shut down if something happens to the wiring. However, that does not explain why the relay has voltage in standby and alarm situations. The next paragraph offers another option. This is not a communicating relay. It does not have enough parts on the board for that. However, the relay module is polarized allowing it to be connected to a reverse polarity circuit for supervision required by code. I am betting the relay is connected to a supervised circuit which will be in reverse polarity in standby mode. 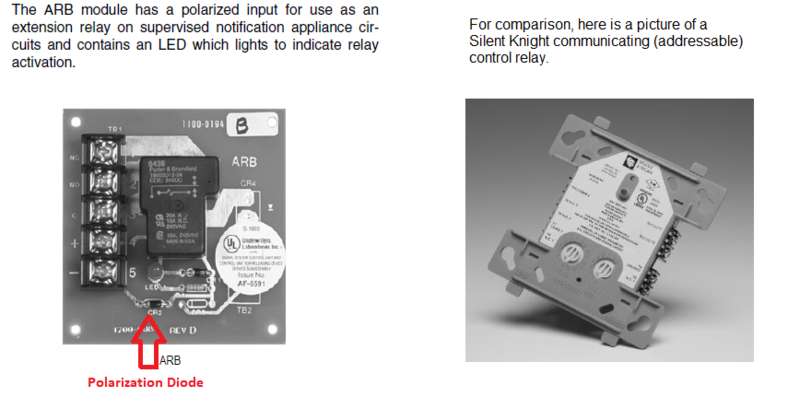 The relay board terminals will have voltage but not be able to activate the relay. This allows the FACP to supervise the wiring to the relay. When the system goes into alarm the circuit switches to alarm polarity which can activate the relay. Retired STR-SG wrote: When the fire alarm system is normal and your HVAC unit is running, is the LED on the relay board ON or OFF? If the LED is on when normal the circuit is wired "fail safe" so that the unit will shut down if something happens to the wiring. However, that does not explain why the relay has voltage in standby and alarm situations. The next paragraph offers another option. Thank you for the reply. When the panel is in normal operation. (No alarm) the red light is lit/ON On the relay. My ac unit is wired through the normally open contacts. This tells me the coil is energized, closing my normally open contacts when there is no alarm. I understand what you are saying about the reverse polarity in fault/alarm mode. Maybe on the board there is a one way diode so once the polarity switches the positive wire does not make it to the relay coil not allowing it to reach the coil. But if you check at the terminals on the board you will still have the dc power. Could this be true in its operation? Anthonyac1 wrote: Thank you for the reply. When the panel is in normal operation. (No alarm) the red light is lit/ON On the relay. My ac unit is wired through the normally open contacts. This tells me the coil is energized, closing my normally open contacts when there is no alarm. That says the relay is operated in fail safe mode, which is constantly powered with the power dropped on alarm. Since I don't know all the details of this system I have to make some educated guesses on its operation. It is possible that the AHU control relay is wired to a reverse polarity circuit that is being held turned ON in normal operation. When turned OFF in alarm the polarity would go back to the supervisory mode which would still have voltage at the relay terminals that cannot operate the relay. I lifted some information from the datasheet you linked. It does state the relay is polarized for operation on a reverse polarity circuit. It is being done backwards in this system. It is possible that fail safe operation was in the job specifications and the FA tech used what he had available to make it work as specified to satisfy the engineer. In the picture below I drew an arrow to the diode on the board that makes it polarized. The banded end of CR2 is the cathode end of the diode which goes to the negative terminal. The diode conducts when the cathode is more negative than the anode end which allows the relay to energize. One question. Is this a new installation or an update to an older site? Thank you again for hanging in there with me and explaining the operation to me. The reverse polarity from the panel is pretty basic technology and totally makes sense. But it’s something new I learned with your help. I know your not saying this is the setup in this building. But it’s one way a panel can be set up to operate. Pretty cool. To answer your question no this is not a new installation or an update to a site. At least not this particular relay circuit. This particular relay can be maybe 5 or 10+ years old. It’s the same model as the one in the pdf posted but I can tell it’s an older version. I looked on the older version relay and it also has the one way diode. So I’m sure it has the same function. However I have seen another part of this building that has been remodeled and obviously brought up to the new codes. In this section of the building I see the silent knight relays that you posted. I don’t know if the silent night relay is tied to the same panel or it’s tied to a newer panel. With the silent knight relay in normal operation the L.E.D will be a slow green flash. Then in alarm mode it has a solid green light. If my memory serves me right. That is how I remember it. I had to do a walk through confirming all Hvac units are shutting down in alarm. This one did shut down properly. While there are about 10 other ac units utilizing the arb relay board that will not shut down in alarm mode. In alarm mode they still have the red light on. So it’s some issue with the fire alarm panel controlling those older relays.